Why this fascinates me …? have noticed this “light” switch for years. 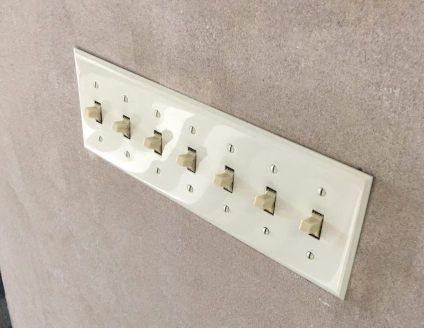 I put quotes around “light” as it’s not “A” light switch, rather it’s 7 switches. Why this fascinates me I have no idea. But, it does. First of all, I’ve never seen it in any other position than this, with all 7 switches in what I presume to be, the ON position. So, my first question is why not just 1 switch? Or, maybe a 3 and then a 4 way switch? It just seems so, confusing and complicated. It’s in a medical facility, thus why I would see it, of course. No, it’s not in a clinic or treatment area so no, it’s not wired to oxygen, movable beds, or patient TVs. I have this urge to turn them all off and then back on with two swipes of my forearm. I don’t of course, but it always crosses my mind. Yes, this is the mind of a very disturbed man who is never starved for blog content. Thank you, and good day. « MMeM, Vol. 15 Issue 12 – Achoo!